Abstract. Tropospheric ozone is important for the Earth's climate and air quality. 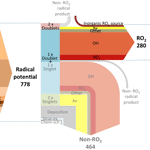 It is produced during the oxidation of organics in the presence of nitrogen oxides. 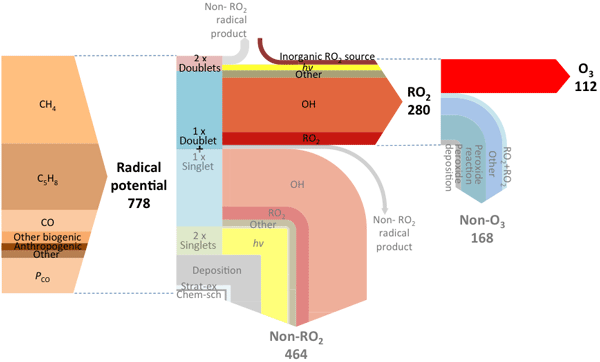 Due to the range of organic species emitted and the chain-like nature of their oxidation, this chemistry is complex and understanding the role of different processes (emission, deposition, chemistry) is difficult. We demonstrate a new methodology for diagnosing ozone production based on the processing of bonds contained within emitted molecules, the fate of which is determined by the conservation of spin of the bonding electrons. Using this methodology to diagnose ozone production in the GEOS-Chem chemical transport model, we demonstrate its advantages over the standard diagnostic. We show that the number of bonds emitted, their chemistry and lifetime, and feedbacks on OH are all important in determining the ozone production within the model and its sensitivity to changes. This insight may allow future model–model comparisons to better identify the root causes of model differences. How to cite: Edwards, P. M. and Evans, M. J.: A new diagnostic for tropospheric ozone production, Atmos. Chem. Phys., 17, 13669-13680, https://doi.org/10.5194/acp-17-13669-2017, 2017. Understanding tropospheric ozone chemistry has been at the centre of the field of atmospheric chemistry for the last 30 years. However, our conceptual approach to diagnosing ozone production in global models has not advanced in this time. Our work presents a new and powerful approach for diagnosing tropospheric ozone production, providing a significant enhancement in our ability to understand the processes controlling ozone and how we can validate our assessment of these processes.